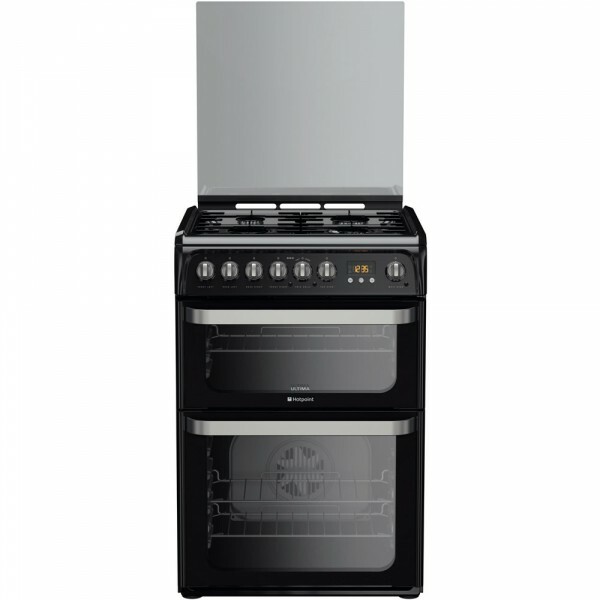 Product information "Hotpoint HUD61K Cooker Gas Double Oven 60cm"
Hotpoint's reliable, multifunctional HUD61K Dual Fuel Cooker delivers a combination of electric and gas cooking, with modern styling, convenience and safety! The AA-rated cooker has a roomy, 65-litre main electric oven with a fan to ensure even distribution of heat, a 35-litre separate electric grill, and a four-burner gas hob with a glass lid, offering plenty of variety when it comes to cooking options. With automatic ignition and flame safety devices on every burner, the hob offers all the fast response and efficiency of gas cooking supported by ease of use. With an electronic programmable timer, easy-read LCD display and catalytic self-cleaning liners in both cavities, the stylish Hotpoint HUD61K Dual Fuel Cooker is an exceptionally convenient solution to day-to-day cooking. Related links to "Hotpoint HUD61K Cooker Gas Double Oven 60cm"
Customer review for "Hotpoint HUD61K Cooker Gas Double Oven 60cm"